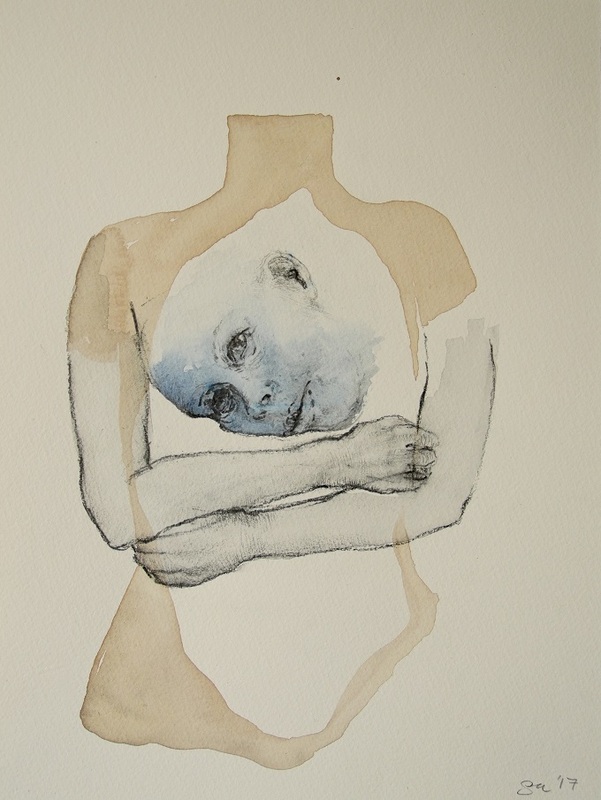 Sharon Kelly watercolours with graphite form a half of two persons exhibition titled Dissolving into ambiguity with Lenka Davidikova( b 1980, Dolny Kubin, Slovak Republic). Both graduated from the University of Ulster – 26 years apart. I have written about Kelly’s drawings and video before, this little collection marks a shift towards poetic freedom, freedom offered to and by complex ideas visible as a transportable object. Meditation. Drawing a drawing. The process is opened bare, equivalent to the fragment of the motif, the marks flow on the hand and forearm, and next to and around, as if competing how much each dares to escape the duty of describing. The distinction between the noun “drawing” and the verb, is meaningful. Once explicit as duration, as process, with a beginning and an end, and once as stasis, a stable moment when the past becomes the present and the future. Once observed or imagined, the motif determines the mortality of other variations, hinted at by abrupt cuts or empty areas. 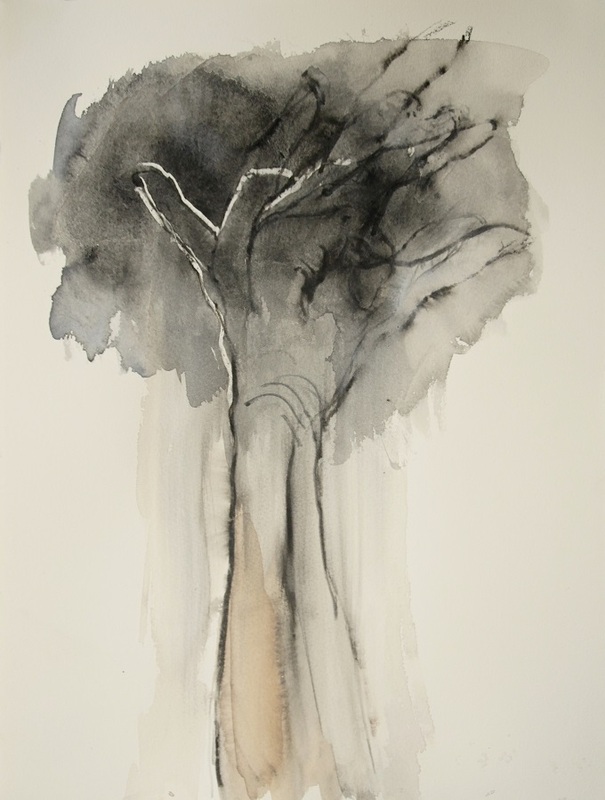 Both watercolour and graphite offer generously fluent suggestion of what is not optically there. Conversely, the anatomy while madly disturbed, still holds to life. The headless torso is like a flat, fluid “garment”. The voluminous blue selfportrait suggests depth. 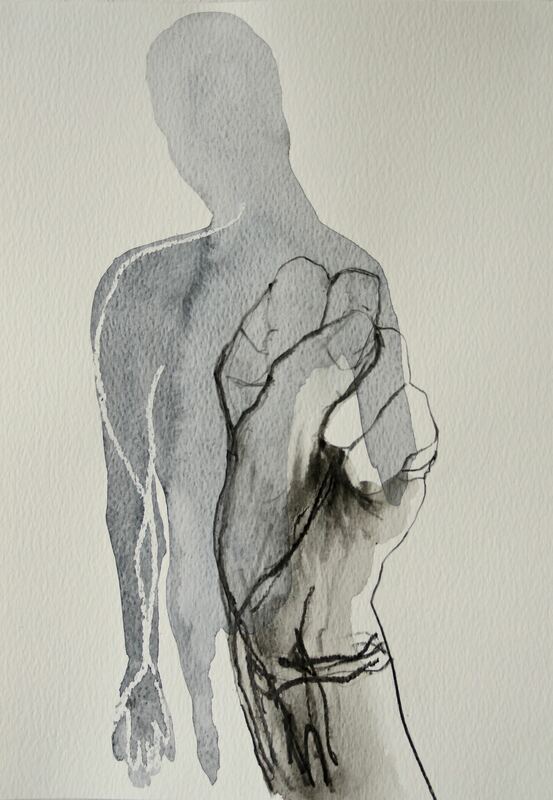 The convincing charcoal outlines and modelling follow the obedient observation of arms and hands with confident denial when, for example, the outline of the left arm is visible through the right hand’s fingers. It is real, but only as a dream is real. Habitually – blue sky is behind white clouds. Poetical visual trope reverses that, the cloud being blue and sky “white” or near white. And the “cut-off” hand is alive and caressing the air as if not wishing to catch the blue apparition; rather it looks as if the hand gently released that fluffy blue. Drawing as a verb inhabits immaterial world. It prefers the world of thoughts to that of objects. Jealously, it is ephemeral, guiding its privacy, and at times it is impossible to apprehend it by senses. Hands can draw in the air leaving no trace, yet transporting an instruction or expression. Issuing sheer joy of co-existence of a blue blob with the anatomically correct hand – the hand treats the cloud as it would treat a butterfly – afraid that touching it will disable it. “…the animation work took place over a number of months and it meant I had to shut all daylight out of the studio to keep the artificial light constant for stop motion work. It was one charcoal drawing that changed, slowly so the whole process is very slow and can be almost impossible to work gesturally. From the middle of March I was able to lift the window coverings and clear the space and explore imagery with watercolour and pencil. So the watercolour work was like a flash of spontaneity in approach! The animation was for a projection for a dance production, a project I have been involved with for about 3 years and explored the territory of grief over time. “(email to me 15th May 2017). Indeed grief is not an object…. 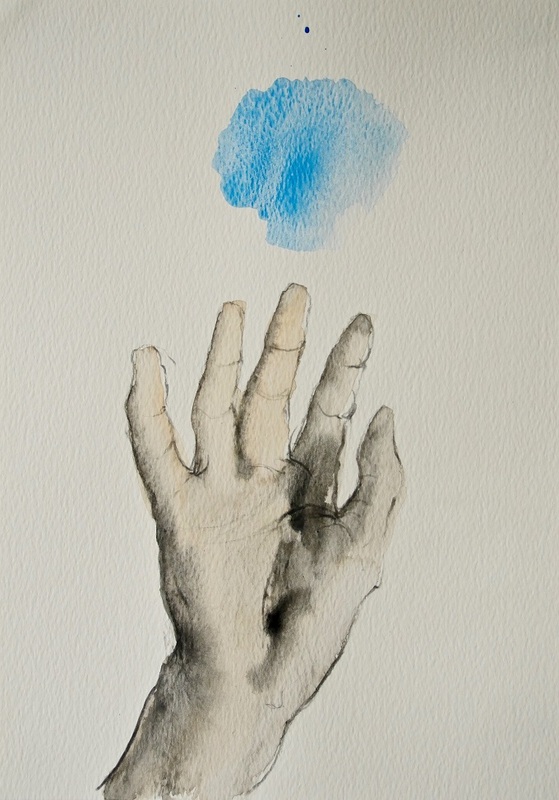 Kelly’s use of a blue as a fragment of sky,or of a head or a hand as a fragment of her own body, invite comparison with a very well known drawing of hands by Albrecht Durer. Like Durer she confidently places a fragment of the living form into a viewing frame. Both ground the meaning in a state of mind when it escapes the uncertainties of daily life. There is a habitual hierarchy between the drawing as a work of art and a drawing as a study. Both Durer and Kelly cherish the responsiveness of drawing to hold its truth without becoming a servant to any one truth. Both give the viewer a freedom to complete what is visible by what he or she imagines. And that is, as Giordano Bruno advises ” a bottomless well”. 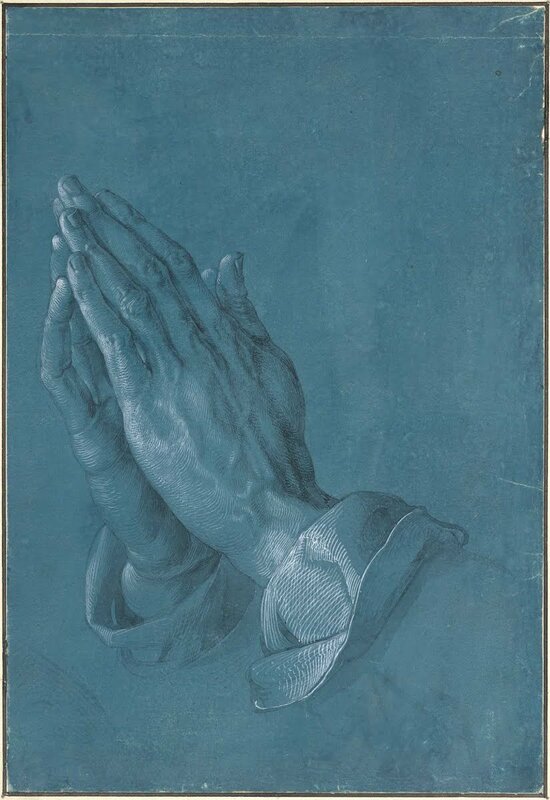 Durer connects the hands with status and the belief in a superior being. Kelly’s connection is grounded here but sends empathy over there into the universe. Image of grief? Image of empathy? It seems to oscillate, preventing me to be sure, except that the graduated definition of the watercolour mark moves from a standing firmly on the ground to an attack by emotion that disintegrates the head and part of one arm… The darkened volume of clashed fists belongs to despair. The materials are promiscuous. Making mark with whatever is willing to do that on the ground of choice is not an anthropocentric act, it appears across the animal kingdom. The same tone of a hue expresses despair and resolve in relation to different outlines that are “carved” either from a light or darkness. It activates our cognitive faculties, invention, daring, scaring, feeling, intuitive guessing. It marks territory of invention that is mute, visual. 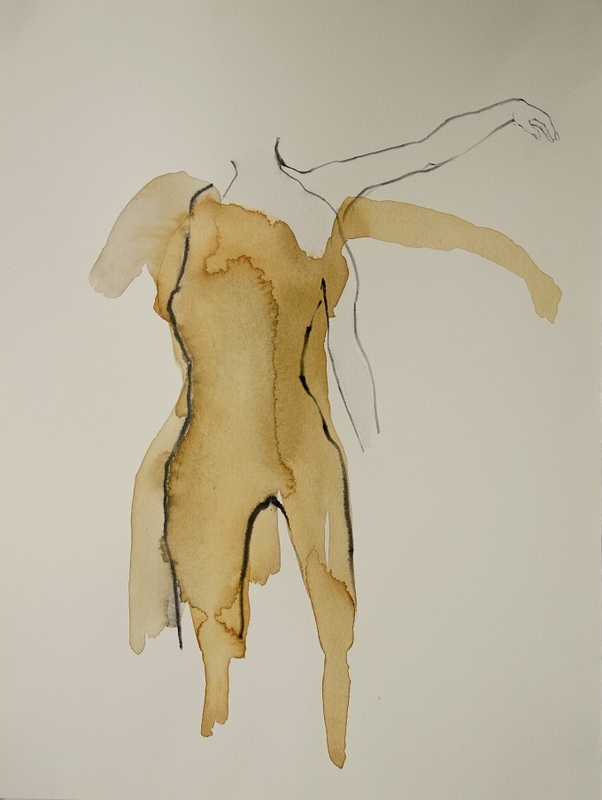 In the next image – a memory of a dancing ballerina… both wet and dry outlines are obedient and enclose the from with clarity. 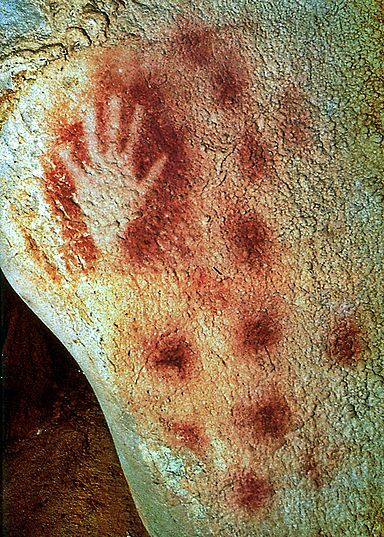 A drawing becomes sometimes evidence or a witness – like the print of hands on the prehistoric rock face. 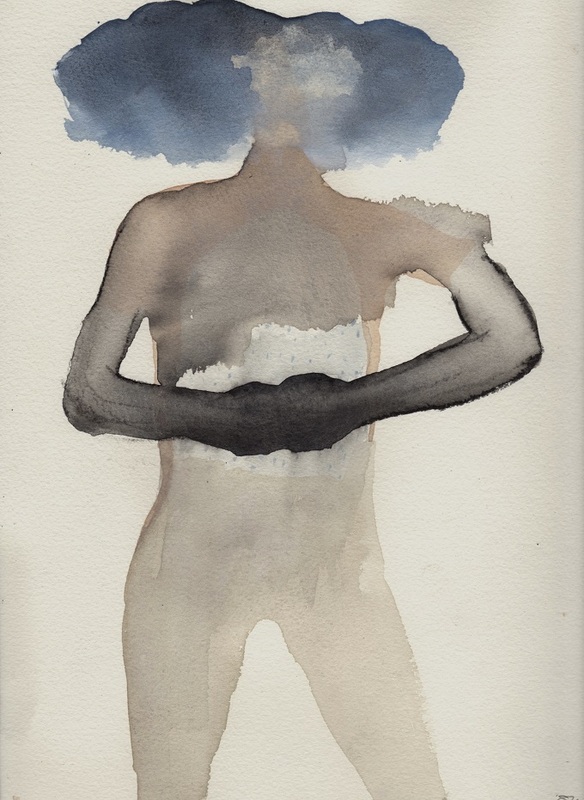 Drawings addresses us as individuals, secretly offering seductive respect as a bribe. They flaunt their beauty, intelligence, even their hidden sources, through the rhythm of the trace and its tone. Even when there is a story, it is secondary. The viewer is invited to make up hers or his own. The lines and texture are the main message, however much they pretend to be just messengers. Drawing is gloriously free – any size, any material, any subject, from a sketch for a monumental building to an acute observation of a fly, to a definition of the plant atlas, to private loving greetings. Apollo or Dionysius? A wrong question. How much of each is in each drawing is the correct one. It is the classical Greek moira, a measure, of each that differentiates the characters of drawings. 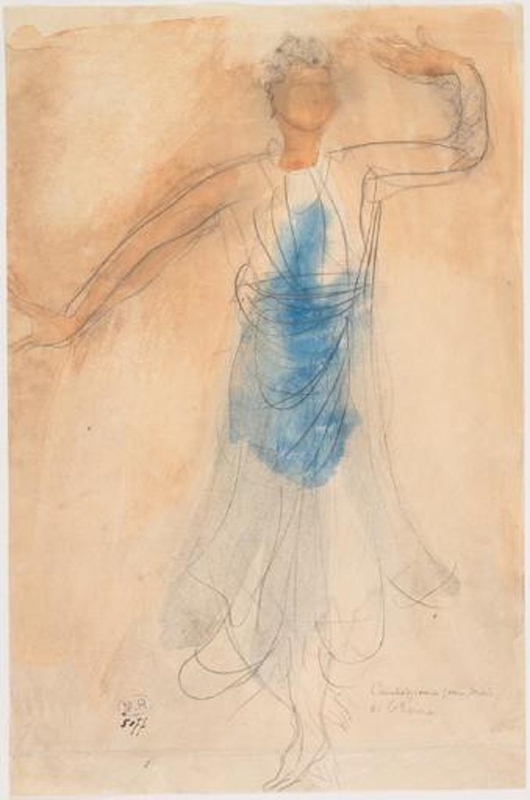 Rodin is reported saying that the Cambodian Dancers made him think of antiquity. I sense complicity in these drawings between silent observation and mute inner world to make all over perspective redundant – or at least discreet. Some drawings do not like to be an end – they wish to serve as a seedbed of different meanings. What is it like to despair? What is it like to feel happy? Human condition opposes certainty ( with the exception of death, which seems to tower over this image). The nurtured faith in the benevolence of fate recedes to allow uncertainty as a subject matter in. 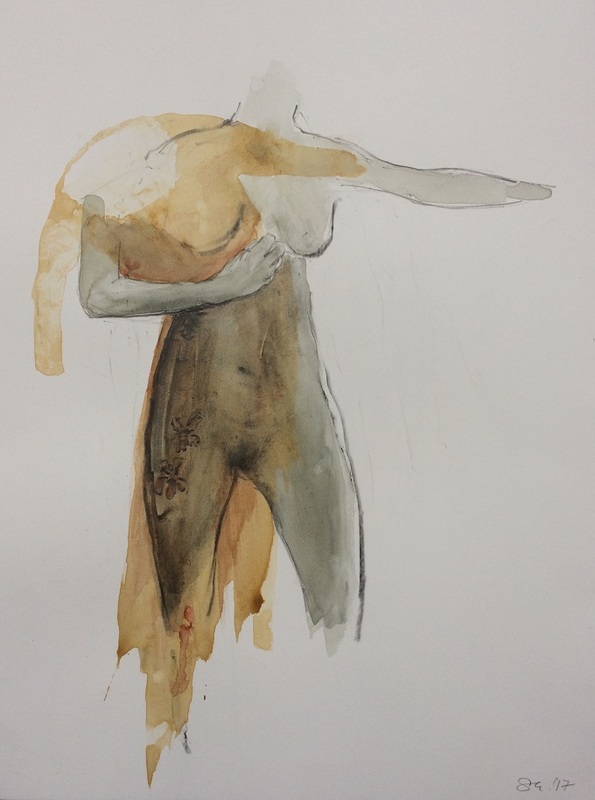 Some drawings submit their force to a fresco or concrete and glass, or stone and bronze, other drawings, Kelly’s drawings amongst them, confidently stand alone: I am who I am. Let your senses and mind resonate with what you look at. There are treasures to be had. Images courtesy Sharon Kelly and the gallery ArtisAnn unless otherwise credited above. 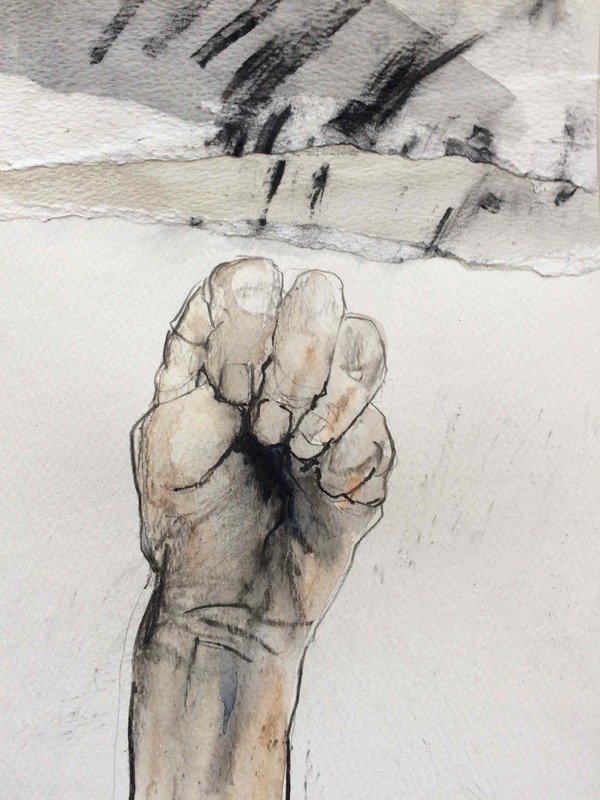 This entry was posted in essay, review and tagged Albrecht Duerer, ArtisAnn gallery, August Rodin, Bertrand Russell, dance, drawing, Giordano Bruno, graphite, grief, Sharon Kelly, watercolour. Bookmark the permalink.